Be careful if the string spans more than one line. If so, paste the string into a text editor and remove any spurious linefeeds (there shouldn’t be any). YMMV, depending on which browser you use. I pasted it as a continuous string from my source, so you should be able to grab and use it that way, too. My source, BTW, is a tip that appeared at onMSFT.com on 5/6/17. 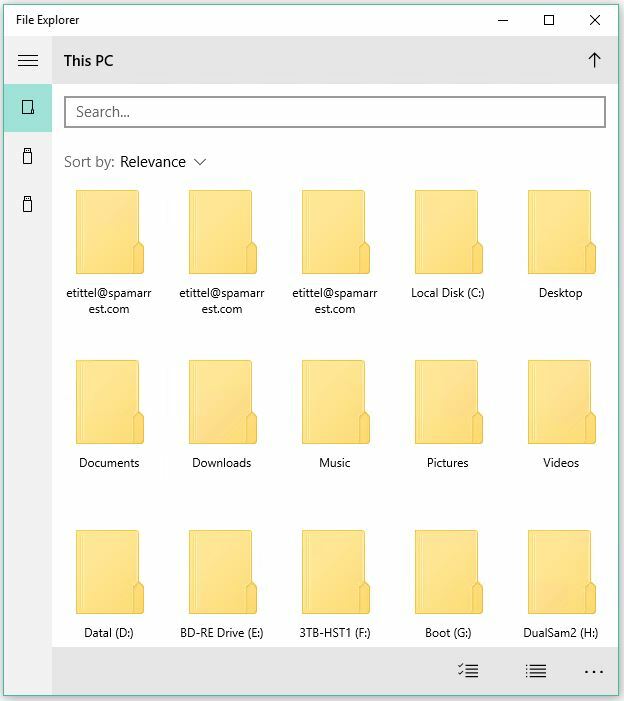 What Does Insider Win10 UWP File Explorer Look Like? The UI is greatly stripped down and simplified in UWP File Explorer. I’m curious, but by no means ready to switch over from the old version. 1. It’s greatly stripped down from the explorer.exe version. There are only minimal display controls (icons at lower right include only list and icon view, a simplified checkbox selection capability, and limited “other” options under the ellipsis at furthest bottom right). 2. I really miss the ability to display file details, such as size, creation/modification dates, and so forth. 3. I likewise miss the ribbon with its extensive, context-sensitive controls. 4. The search function is slow and seems a bit cumbersome (I use VoidTools Everything anyway, so I’m spoiled). Overall, this earliest version seems more like a throwaway experiment or a toy implementation, rather than a serious contender to replace the current heavyweight version of File Explorer. But with Windows S looming and UWP the main UI for touch and limited-capability versions of Windows I don’t expect things to stay that way for long. It’s interesting though, and worth checking out, for those who have an interest in such things. 3. Paste the string into the location box in the Create Shortcut window, then click next. That’s it. The shortcut will appear on your desktop. Double-click same to launch the Insider Win10 UWP File Explorer. Enjoy!